In honor of Greg Gibson (Gibby) and his dog Nino who died in a house fire on January 8, 2016, the Gibby Home Fire Prevention Campaign was created to save lives and increase awareness about how to prevent home fires. Our Mission is to generate awareness about how to prevent house fires and provide free fire protection tools for those in need. *Money will go towards the website, mobile app, social media campaign, documentary video on house fire danger, public service announcements, Gibby and Nino merchandise, events, better laws, helping fire prevention agencies, supplying fire extinguishers and smoke detectors for the poor, and more. Gibby and Nino will be for Home Fire Prevention as Smokey is to Forest Fires! 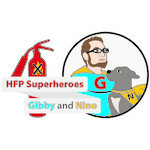 Be a Home Fire Prevention Superhero like Gibby and Nino!